The Club at Meadowbrook is a 55+ community located in Salem, New Hampshire. There are 117 units in the complex, all tastefully appointed with high-end features that make this a stand out active adult community in the Manchester Area. Homeowners can make use of the clubhouse and its amenities that allow them opportunities to stay fit and active as well as to socialize with neighbors. The Club at Meadowbrook is ideally located near both Manchester and Boston with daily conveniences and shopping close by. Residents at The Club at Meadowbrook have access to amenities that connect them with opportunities for activities, recreation, and socializing. A clubhouse at the heart of the community is a natural gathering place with multi-purpose room perfect for club meetings, social events, and holiday parties. An exercise rooms allows residents to start a fitness routine. A billiards room is perfect for friendly competitions among neighbors. Outdoors, a patio looks out on the community's manicured grounds. Paved walking paths run throughout the outdoor areas. There are 117 condo units in The Club at Meadowbrook. Several floor plans are available with two bedrooms, two bathrooms, and assigned parking spaces. These units feature nine-foot ceilings with crown molding. Hardwood flooring is in the common areas with carpet in the bedrooms. The master bath has high-end fixtures and a separate shower and soaking tub. Kitchens feature stainless steel appliances and granite countertops that open up into the living room, many of which have functioning fireplaces. All units have private balconies, perfect for enjoying warm summer days. Residents enjoy a relaxing lifestyle with plenty of opportunities for activity and recreation. Multi-purpose rooms and a kitchen are perfect for social gatherings and holiday parties. Residents can relax with a good book on the patio or enjoy a friendly game of billiards among neighbors. Homeowners have plenty of time for the activities they love, knowing that all building and common area maintenance is provided by the homeowners' association. The Club at Meadowbrook is located in Salem, NH. The community is conveniently close to daily necessities with a Market Basket, Target, Walgreens, HomeGoods, and many other retail stores and restaurants located just one-and-a-half miles away. There are six golf courses within ten miles of the community, giving golfers plenty to explore. For those that love the outdoors there are several nature areas, preserved wet lands, and state forests in the area. The community is ideally located within the region with Manchester, NH, 25 miles to the northwest and Boston 33 miles to the southeast, making both easily accessible for day trips. Interstate 93 is just two miles away, making travel throughout New England easy. When long-distance travel is required, Boston Logan International Airport is just under 35 miles away. 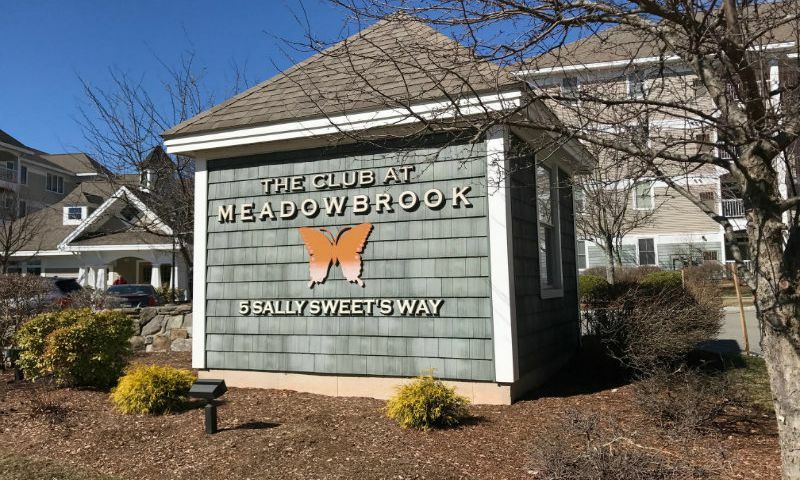 Homebuyers looking for a 55+ condo community with all maintenance provided will find a lot to love about The Club at Meadowbrook in Salem, NH. Check back soon for more information on the lifestyle in The Club at Meadowbrook. 55places.com is not affiliated with the developer(s) or homeowners association of The Club at Meadowbrook. The information you submit is distributed to a 55places.com Partner Agent, who is a licensed real estate agent. The information regarding The Club at Meadowbrook has not been verified or approved by the developer or homeowners association. Please verify all information prior to purchasing. 55places.com is not responsible for any errors regarding the information displayed on this website.